Allison (and others, like a game developer named Lat) showed interest in these Neurosky Mindwave headsets. They're little wireless (bluetooth, almost!) headsets that ship with a cheap USB dongle and expose their data via a binary protocol. The protocol is not consistently and well documented. It's out there, if you can craft the right search queries. For the USB widget, you need to implement the basic handshake commands to attempt to connect to a given (or any) headset. Then you also need to implement the data decoding for the raw and processed data. Now, I don't want to go into the details - you can read the documentation and my very bad, hacked up code. The USB dongle didn't work with FreeBSD-9.x. It's a cheap chipset (CH341) and it just wouldn't transmit. It works fine on FreeBSD-HEAD though. So, to explore it, I wrote a simple, hackish library to encapsulate pairing, parsing, data gathering. It needs a lot of improvement but it's there. 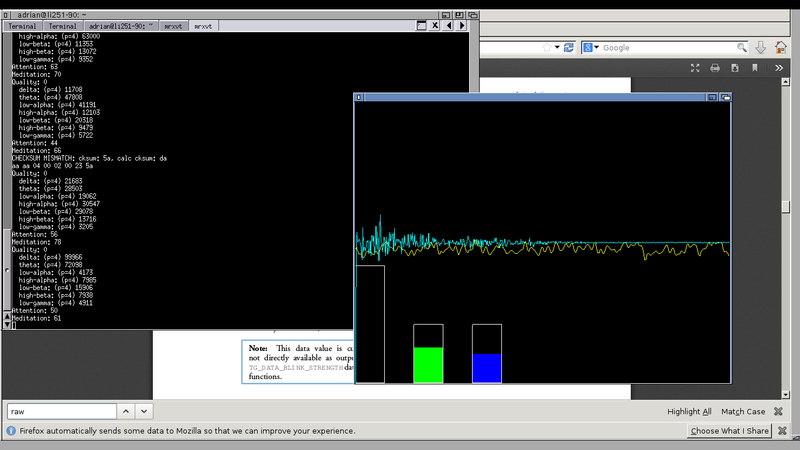 Then, I (re-)learnt enough SDL and OpenGL to plot some data points. Finally, I grabbed a FFT library to poke at the returned data to see if it makes sense. A few points thus far. I still haven't found any correlation with the attention / meditation parameters the firmware returns. For the most part, you just have to stop any kind of muscular movements. The raw values clip very easily with any kind of muscular movement. I can see how to decode say, "blink" as a muscular action though. I've only started looking at the raw FFT results. Hopefully with a bit of filtering I'll see things that actually look like basic EEG results, or I'll concede these things are expensive muscular reaction devices.